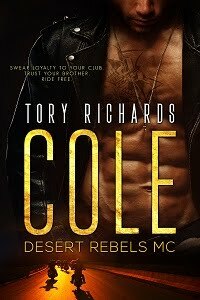 TORY RICHARDS: Sneak Peek Sunday! What is sneak peek Sunday? It's where a group of authors post 6 paragraphs (no more, no less) from either a WIP or a published work. So make sure you click on the link above. No telling what you'll come across. And just have fun! This week I've decided to post 6 unedited paragraphs of a current WIP I'm just about to finish up. Let me know what you think about it. Barnie was weaving in and around her bare legs, arching his back for attention. He seemed oblivious to her sudden concerns. Brooke got to her feet, wondering what she should do. She remembered reading an article once, about sleeping with your car keys so if someone broke into your house you could set your car alarm off, and possibly scare them away. Now she wished she had taken the advice more seriously. Her next thought was that her cell was in her purse, downstairs. Lord, how could she have been so careless? Knowing there was no land-line she would have to make her way down there and get it if she wanted to phone the police. Another, louder sound decided it for her. She tried to gauge where the sound had come from. “Not now, Barnie!” she whispered sharply. Brooke slowly made her way to the bedroom door, pausing to listen in the thresh hold. Whoever was downstairs must have thought they were alone. They weren’t even trying to be quiet. That was good because as long as whoever it was made noise it would tell her where they were, while she made her way to her purse. She closed the door, shutting Barnie inside her bedroom, and walked to the top of the stairs. All the lights were off, but the outside security lights were on and shining through the sheer curtains at the windows. Giving off just enough light so she could see the layout of the room below, and that no one was there. The noise the intruder was making was coming from the kitchen. Brooke was almost certain she heard them slam the fridge door closed, and then the distinctive sound of someone opening a can. Are they actually drinking a beer? She’d brought a six-pack with her, along with a few other staples to get her through the week. Diana and Alex had left her food but there were some things she couldn’t live without. Taking a deep breath, Brooke rushed down the carpeted steps in her bare feet. She stopped at the bottom and listened again. Her jaw dropped in surprise when she noticed the kitchen light had been turned on. Talk about a brazen burglar! She glanced toward the living room, remembering that her purse was on the floor at the end of the sofa. In order to get to it she would have to pass the kitchen doorway. Fun shifting from the fear of a stranger breaking in to the sense that she's about to encounter someone who thinks he or she has a right to be there.